According to the data above, the important task of China’s 13th Five-Year Plan for Its Textile and Apparel Industry is to control the total quantity and to improve quality. In my opinion, the development of China in the past few decades, from the stage of development of the entire industry point of view, brand is one of the biggest short boards. China lacks of international brands. In the consumption area, there is the lack of very high-shared brands, and the number of brands is also very low. I think China’s textile and apparel industry need to make efforts in this field to make plans. As shown in the data above, I noticed that China is going to slowly shift the focus from apparel manufacturing to textile manufacturing and the Research & Development aspect for apparels. It is good for China to make these changes as this reflected that China has reached another stage of development. 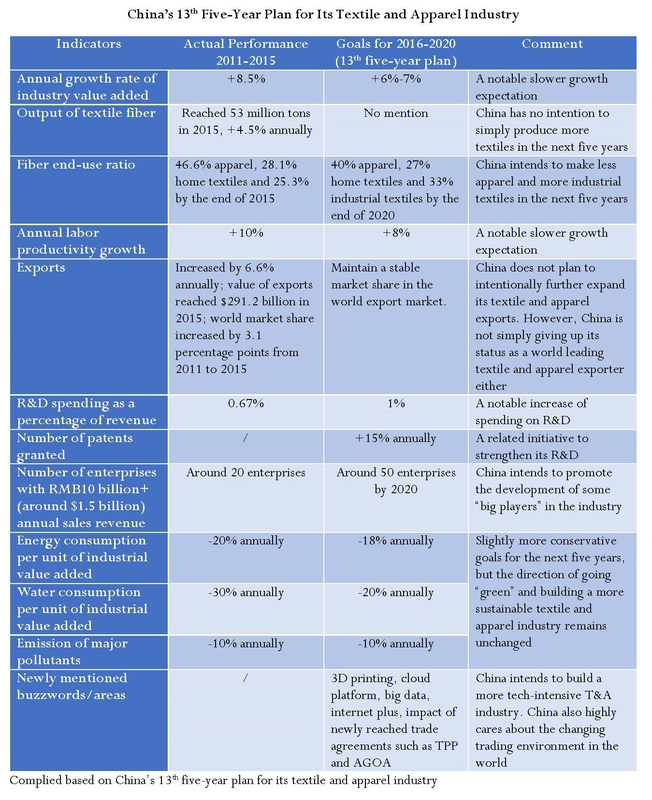 In recent years, China has focused on improving the infrastructures and technology, the data also stated that China intends to build more technology-intensive T&A industry. However, I think the environmental problems and development of sustainable fashion are some crucial issues that the Chinese government should really pay attention to before making other changes in developing the local T&A industry.